Will we see more babies named George in England and Wales? A few days ago Prince William and Duchess Catherine of Cambridge gave birth to Prince George. Today at the office we were wondering if we will see more babies names George in UK. Very important question indeed! So I went to the UK National Statistics website and looked for baby names in UK. Let’s focus on England and Wales only. There are two datasets for what we are looking for: one for the period 1904-1994 (by 10 years steps) and one for 2004 (if we want to be consistent with the 10 years step in the first dataset). 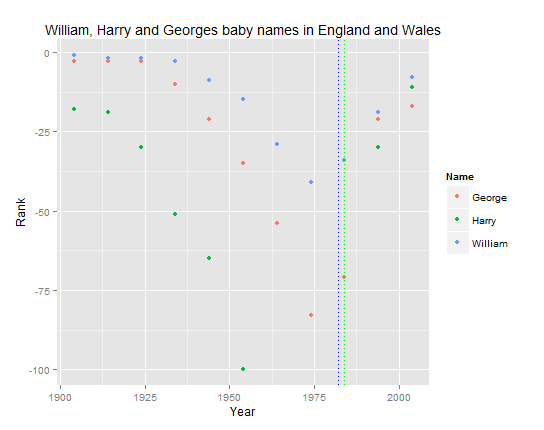 I extracted the ranking relevant for us here: for babies called William, George (and Harry, William’s brother). The data is here. If we plot these rankings we see for William that there could be a “Prince effect”. Indeed this name was less and less used in the 20th century (blue dots) until Prince William’s birth in 1982 (blue dotted line). Idem for the name Harry (green dots) that didn’t even made it into the top 100 in 1964, 1974 and 1984 ; but it reappeared at the 30th rank in 1994 (he was born in 1984, green dotted line). Now for the name George, it’s a bit different. The name was also going down the ranking until 1974 when it reached the 83rd rank. After that it went up again. So does it invalidate the “Prince effect” mentioned earlier? Maybe it’s more a “famous effect” since other famous Georges were famous (George Michael, George Clooney, George Best, George Weasley, … from Yahoo!). Maybe the appearance of television shows in colour (1966 for BBC) made this name popular? Do you see other reason? But even from the already high 17th in popularity now I still expect the name George to gain even more popularity. Btw I discovered that The Guardian ran a similar story (excluding Harry however).